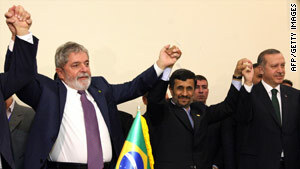 Luiz Inacio Lula da Silva, Mahmoud Ahmadinejad and Recep Tayyip Erdogan broker a nuclear deal. (CNN) -- Iran says it will formally notify the U.N. nuclear watchdog agency on Monday of its nuclear swap agreement with Turkey, according to state-run media. The deal, which was reached Sunday after 18 hours of negotiations between the foreign ministers of Iran, Brazil and Turkey, calls for Iran to hand over nearly half of its estimated supply of low-enriched uranium to Turkey. Turkish Foreign Minister Ahmet Davutoglu called this week's agreement for an Iranian nuclear swap one of the most important diplomatic decisions in the 30-year history of the Islamic Republic of Iran. A letter on the agreement will be submitted to International Atomic Energy Agency chief Yukiya Amano on Monday, the Islamic Republic News Agency reported Friday, citing a statement from Iran's National Security Council. The deal has not swayed the United States and its international partners, who this week drafted a fresh set of tough sanctions against Iran over its nuclear program. Speaking before the U.S. Senate Foreign Relations Committee, Secretary of State Hillary Clinton said Tuesday that the United States has been "working closely" with the group known as the P5 plus 1 on a resolution to present to the U.N. Security Council. The P5 plus 1 includes the five permanent members of the Security Council -- the United States, China, Russia, France and Britain -- as well as Germany. That draft resolution restates the Security Council's demand that Tehran suspend enrichment activities and other proliferation-sensitive nuclear activities. It requires Tehran to cooperate fully with the IAEA. • Expanding an arms embargo to include eight categories of conventional weapons, including tanks, armored combat vehicles and combat aircraft. • Requiring nations to inspect ships or planes heading in or out of Iran if banned materials are suspected of being on board. • Banning the opening of new Iranian bank branches or offices of financial institutions if they are linked to nuclear programs. • Freezing assets and banning travel of individuals and companies dealing with Iran's Islamic Revolutionary Guard Corps. • Prohibiting Iranian investment in foreign commercial activities capable of delivering nuclear weapons. The restrictions would be part of a fourth round of U.N. sanctions slapped on Iran. Ali Akbar Javanfekr, an adviser to Iranian President Mahmoud Ahmadinejad, told CNN that Clinton's statement that key nations had reached agreement on a strong U.N. resolution would not hurt Iran, but instead would alienate the United States. "Mrs. Clinton can have her opinions, but every day that passes the position of the Islamic Republic gains more support in the world while America is losing its allies because of its illogical position," Javanfekr said. Western nations still believe Iran has military ambitions, though Iran denies that claim, saying its nuclear program is reserved solely for peaceful purposes. "Iran has remained in violation of previous Security Council resolutions. It is in violation of its IAEA obligations, and that is why we are here today, making manifest and real the dual-track approach that we have pursued," U.N. Ambassador Susan Rice said Tuesday. "The goal of this resolution is twofold," Rice said. "First, to increase the cost to Iran's leadership for their continued defiance of the international community, and second to persuade Iran that it is in its interest to peacefully resolve concerns about its nuclear program. This draft seeks to support, and not replace, our efforts to engage Iran diplomatically."